Ireland boss Martin O’Neill says he would like to see Daryl Murphy and Wes Hoolahan at John O’Shea’s final international game next month. O'Shea will get the chance to say farewell to Ireland fans on 2 June. 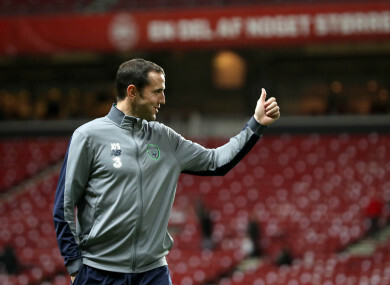 JOHN O’SHEA’S contribution to Irish football has been praised by the senior international manager. Yesterday, it was announced that the Waterford-born defender is calling time on his career with the Boys in Green after 17 years. The friendly match at home to the US next month will be O’Shea’s final game, and it gives fans the opportunity to bid farewell to one of the country’s most-decorated servants. Now at Sunderland, the 37-year-old played the majority of his club career at Manchester United — winning five Premier League titles, the FA Cup and the Champions League. “He has been a fantastic servant, not only for the Republic of Ireland, with over 100 caps, but also his clubs,” O’Neill said SPAR FAI Primary School 5s Programme today. He has been mainly associated with Manchester United and was part of that successful side that they had for a number of years. O’Shea joins Wes Hoolahan and Daryl Murphy on the list of recent international retirees, but Jon Walters will remain on board for the upcoming Euro 2020 qualification campaign. While O’Shea will be involved, O’Neill would also like to see the other pair at the Aviva Stadium on 2 June. “I was hoping that Wes would at least come to Dublin to be there because I think that he played a big part in the proceedings, in terms of us getting to the Euros and then being there,” O’Neill added. “If you are talking about other players, sometimes players retire themselves, and that’s fine. It’s what John has done. Sometimes they get retired, but I don’t think that it’s really my job to tell players when to retire if they feel that they can still do it. A standout moment in the green jersey was O’Shea’s last-gasp equaliser away to the world champions Germany on the same night he won his 100th cap back in 2014. “What a goal and in the last minute of the match to grab a draw,” O’Neill remembered. “That was as big a goal as any we scored in the qualifying matches. “In one sense, a bit like Robbie Keane, I wish I had him when he was absolutely in his prime. I am not saying that John was on the decline, far from it, but it would have been nice to have him in his mid-20s. “But he was influential, like Robbie Keane, always wanting to help the younger players and that was a big factor too. But on the field of play, he had a good influence on the side and that was very important in the early stages of my time here. Email “'Sometimes players retire themselves, and that’s fine. It’s what John has done. Sometimes they get retired' ”. Feedback on “'Sometimes players retire themselves, and that’s fine. It’s what John has done. Sometimes they get retired' ”.